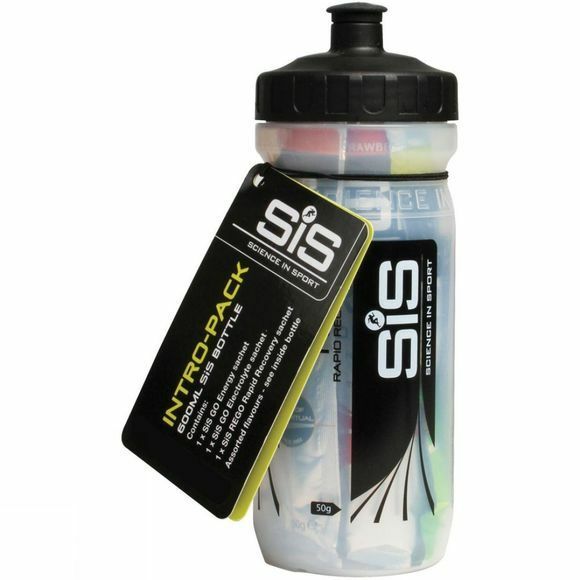 The SiS Intro pack is the perfect gift for road cyclists. With a 600ml bottle and a range of 3 different sachets to keep you energised and hydrated, the intro pack helps you get the most out of your rides. Carbohydrate mix (53%) (Maltodextrin (from Maize), Fructose), Protein (27%) (Soy Protein Isolate), Reduced Fat Cocoa Powder, Electrolytes (5%) (Calcium Lactate, Sodium Chloride, Calcium Phosphate, Magnesium Oxide), Thickener (Xanthan Gum), Emulsifier (Soy Lecithin), L-Carnitine Tartrate, Vitamins (<1%) (l-ascorbic acid, nicotinamide, zinc sulphate, d-alpha-tocopheryl acetate, ferric pyrophosphate, d-pantothenate, calcium, pyridoxine hydrochloride, riboflavin, thiamin mononitrate, calcium salts of citric acid, retinyl acetate, pteroylmonoglutamic acid, d-biotin, potassium iodide, cholecalciferol, cyanocobalamin), Flavourings, Sweetener (Aspartame).